The latest approach to negating the flow of money to the Taliban and Al Qaida is much like the DEA’s similar campaigns in Latin America. In addition to attacking the supply of opium and driving up its price, the strategy will also concentrate on drug dealer money laundering. At first glance this appears to be a win – win situation. Not only do you reduce the amount of drugs in circulation, but you strangle the money faucet to terrorist organizations. Success in Latin America is cited as the model outcome. I’m not convinced it is as cut and dry as it appears. The crux of my discontent is my continuing crusade for a bottom up information engagement campaign. In this case the bottom of the pile is the farmer. The AP story begs the question of the farmer and concentrates on the Obama Administration’s strategy’s emphasizing the supply and money chains. Long term problems with drugs will persist as long as there is big money to be paid for drugs and the culture and economic well being of the farmer are dependent on opium. The Department of Agriculture needs to be energized to develop a systematic crop replacement for opium. This replacement needs to be cognizant of the growing environment in Afghanistan and the world demand for whatever the replacement crop needs to be. In addition the crop should mirror growing seasons and be highly adaptive to the climate and soil conditions where poppies are currently cultivated. The program should also include short term financial support and/or supply of food and other items that would be needed by the farmers while the new crop is growing and the system to harvest and market it matures. From an information view point a classic marketing ‘teaser’ campaign where pictures of a future secure and prosperous life without the terrorists, Taliban or even unwelcome outsiders of any kind controlling the farmer’s destiny. The messages would stress the increased welfare of the farmers and the positives attributes of the new crop such as positive growing characteristics and a higher income potential. Unless there is research needs to confirm that there is value to messages concerning the reduction of suffering by elimination of the drug trade, I would not employ these messages, not even in passing. In short the combination of agricultural insight, micro-financing and tribally tuned information engagement is the right way to deal with the Afghan opium supply and a strategy that has a far better chance of long term success. The Bde CDR, COL Walter Piatt, proclaimed good news based on his experience in his current and previous tours in Iraq. The positive news includes increased oil production and exporting from the Baiji oil refinery benefiting the province and the country. Piatt also noted construction efforts on al-Askari, or the Golden Mosque. The Mosque, one of the holiest shrines in Iraq was attacked several times in 2006 (see http://www.washingtonpost.com/wp-srv/photo/gallery/070613/GAL-07Jun13-77880/index.html) so that rebuilding the Mosque points to much progress according to COL Piatt. While I am not now, nor have I ever been to Iraq, I wonder how much of this progress is documented by Iraqi media and how much, if any, is covered in Afghanistan and elsewhere. Surely the progress noted here as well as market openings, school building and other hallmarks of positive movement are being observed elsewhere. They could serve as evidence of the country’s growing stabilization and could also offer hope and inspiration for those in Afghanistan and elsewhere. However, while COL Piatt and the Honolulu Star are credible in Hawaii, different sources would need to be leveraged to make the most of the good news to other audiences beyond the Aloha State. These sources would be those that are relied upon by the various target audiences. Ideally those sources would be a complementary mix that could include several broadcast and print media. Furthermore, it would be ideal if local peer leaders could espouse the praises of the progress and exhort their local population to follow the examples of the Iraqis. A less powerful, but workable alternative is to present the progress examples in a neutral light, documenting the success with pictures and quotes from those in the province, or respected international leaders commenting on the specific items of progress. Perhaps it would also be useful for educational purposes if COL Piatt were interviewed and the interviews forwarded through the Army Office of Congressional Liaison or perhaps through private entities such as the PSYOP Regiment or PSYOP Associations. The success stories would serve to reinforce Congressional understanding of the role of PSYOP subsequent to combat and could help to positively influence funding and organizational decisions. SWC has provided similar educational materials such as their recent video on “Why We Fight” which documents efforts surrounding the GWOT. In any event, good news, especially good news that could be documented represents good PSYOP when used judiciously through appropriate credible sources. If this comes to pass it will be a giant step forward in Afghanistan, and, in my view, much needed shift in emphasis for much of the USG strategy in troubled nations. Key of course will be security and coordination between DoS and DoD personnel. While the article states that a heavy concentration of these diplomats will remain at the Embassy in Kabul, there is also mention of Provincial Reconstruction Teams (PRT), a concept which is generally regarded as successful in Iraq. 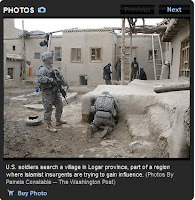 Given the nature of Afghanistan as noted in my previous posts – the more that are out in the villages – the merrier and the more likely USG objectives are to be obtained. Since I’ve commented on negative aspect’s of USG efforts, I felt it was important to point out this positive step. President Obama appears to be carrying through on his promise of ‘ending the war’. He recently announced that the combat mission in Iraq will be over by 2010 (see http://www.military.com/news/article/February-2009/obama-sets-august-2010-for-iraq-withdrawl.html among others). Commanders have announced that a drawdown of forces will start this year, assuming that the level of security in Iraq allows it. There is no specific mention of support of an Iraqi journalistic infrastructure, nor are there comments on the future of military information engagement as this transformation unfolds over the next few years. Clearly there is no indication of how State Department Public Diplomacy would ramp up as military capabilities ramp down. I believe this is likely to be a critical fault of the overall exit strategy and perhaps a negative indication of President Obama’s ability to synergize all of his tools of statecraft simultaneously. Unfortunately a ramp down in Iraq has been accompanied by a ramp up in Afghanistan, the demand for PSYOP has gone up, the supply however, has not. This is very likely to mean a temptation to draw down the information engagement resources in Iraq and transfer them to Afghanistan or the theater dejure. The Administration and DOD must recognize that the information engagement does not end because the combat forces leave, nor does it necessarily change direction because the mission has moved from combat to ‘supporting’. Information engagement, like sales and marketing is a continuous process. This process must be focused and resourced until the desired behavioral objectives have been achieved. It is possible that DOD has or is developing a strategy to replace military information engagement with contractor resources, however, this hasn’t been made clear nor has there been a major increase in recruiting of PSYOP personnel leaving the military by contractors. While a contractor resource may be able to do the job, one wonders if private industry is the right party to do so. The President has pushed an agenda of engagement and transparency – transitioning from those who serve because they want to, to those who serve because, while they may be no less dedicated than those in uniform, are not graded by an OER, but at the end of the day – by profits may not be the best course of action at this point in time. The story indicates that the surge of 17,000 US troops bound for Afghanistan “will be deployed to small remote bases” with many of them in eastern and southern Afghanistan. It is argued by GEN Petraeus and others that counterinsurgency requires forward position to be close the villages in order to protect the population from insurgent attack and build solid relationships with the villagers. Yesterday’s Washington Post offered its own perspective with the story ” U.S. Troops Face a Tangle Of Goals in Afghanistan U.S. Troops Face a Tangle Of Goals in Afghanistan” (http://www.washingtonpost.com/wp-dyn/content/article/2009/03/07/AR2009030702090.html?hpid=topnews) This story addressed the fact that US forces must work in tandem with Afghan police and that the operational tempo and focus of missions can change in heart beat from befriending local village leaders to searching for weapons. The schizophrenic nature of the missions is exacerbated by the availability, competency and ethics of the Afghan police force. According to the Post, “Army commanders in Logar described a daunting list of objectives for the operations they are setting up in two rural provinces south of Kabul, the capital: bring security, reduce support for Taliban insurgents, improve Afghan police and army forces, establish good governance, boost the economy and improve infrastructure such as water and roads.” The US and NATO forces must do all of this while protecting themselves and at the same time. Shifts in emphasis from friendly discussions to moving metal detectors over dung heaps to search for weapons creates significant challenges for the troops and the tactical situation never mind the information engagement implications. Interestingly enough there was a story on the ISAF official website covering the same place at the same time, “ANSF, ISAF target insurgent logistical support in Logar” (http://www.nato.int/isaf/docu/pressreleases/2009/03/pr090308-224.html). According to the official release from ISAF “troops captured an alleged insurgent weapons and explosives supplier …. and came under fire”. The release also acknowledged that a young child was injured during the action, treated at the scene and evacuated to the ISAF hospital at Kandahar for further medical care, where he is recovering well. I believe there are a number of ways to help mitigate the danger while accomplishing the higher level missions. Establish a hub and spoke type of PSYOP organization. Centrally control allocation and dispatch of scare tactical PSYOP resources. Have broad Reachback capability from the hub to key resources. Provide pre-packaged materials to include loud speaker messages that explain the need for security and that reflect a tenor of respect and understanding for the local population. Prepare appropriate written or visual handbills for the different type of missions. Each should reflect the messages that the Afghan government is trying to protect the population from the Taliban and the NATO forces are there to help and support. Stockpile these materials at all bases in the hub’s AO. Maintain honest dialog through the chain of command so that the true state of local Afghan Army and police is known. Where possible bring senior Afghan resources to bear to positively influence unacceptable behavior. Where police have stolen items, these items need to be returned by the police and the offenders dealt with. Establish a forum to share lessons learned and best practices. This becaomes especially important as the number of troops increase and more operations unfold over time. Perhaps the simplest approach might be a Blog at the ISAF level – one that is open to NATO forces, but not the public. Employ whatever local media and local influencers are credible to inform the population of recent activity with an emphasis on publicizing successes. Injuries and damages must be quickly acknowledged and exposure given to treatment and compensation. If possible and appropriate interviews or pictures showing recovered victims in good health or citizens being satisfied with their compensation should also be promoted. Of course careful attention should be paid to security and insuring that the Taliban are neither able to take reprisals or highjack this news for their own purposes. Last week I warned that the mission in Afghanistan would be more dangerous and complex than the one in Iraq. Unfortunately a very good BAD example of what lies ahead appeared in the Washington Post today with the headline: “Tactical Success, Strategic Defeat” (see http://www.washingtonpost.com/wp-dyn/content/article/2009/03/01/AR2009030102203.html). However, the story doesn’t end there as the story continues …”By midmorning, hundreds of angry people were blocking the nearby highway, burning tires and shouting "Death to America!" What went wrong and what went right here? First of all there was a limited military objective and on the surface it appears that there was little if any ‘collateral damage’. So in the short run a few bad guys are off the street and maybe the pace of IEDs in the area will slacken. However, the long run downside is far greater. The raid has become a case of one aw poo erases 100 attaboys. The information engagement challenge is now to run up hill and try move the public feeling meter to neutral and then to positive. This will not be easy. Any relationships or positive images established by US forces took time to do so and while time will sometimes cure many ills, the negative images of the US will likely be fanned locally by the Taliban or other adversaries such as tribes with interests adverse to the US and by the media. Unfortunately the negative image in this village will be exacerbated over the country and potentially the region as TV stations seek to report the news as they see it, no doubt relying on whatever images and/or interviews they have or can get that will play well in light of the messages they want to transmit. 1. Kinetic operations need to be considered in light of the overall impact on the population. 2. Information engagement planning needs to be part of any kinetic operation because local ops such as this one can be regional, national or even international news overnight. 3. Be prepared with messages and images to put the action in as positive a position as possible. Consider embedding appropriate personnel or quickly notifying them after time sensitivity of the operation has passed. 4. A negative reaction of the population must be anticipated, not blamed on “superior Taliban propaganda efforts”. The fact that two field grade officers attribute the negative reactions of the local population to better Taliban propaganda and media efforts is an intelligence indicator of their lack of awareness of the population’s attitudes. 5. Institute a counter propaganda mechanism that can provide media with images and interviews. Note that this is the realm of the PAO who must be a key part of information engagement planning. In sum – this is a warning shot fired over the bow of information engagement in Afghanistan. Let’s recognize it and adjust the course, or we will face the consequences.